The Springfield Park District and the Springfield BMX Club have partnered together to offer a full BMX track nestled in upper Riverside Park. This unique BMX course features a dirt track complete with jumps and turns. The track offers fun and adventure for all ages and ability levels. One way - This is a one way track. Riding in the opposite direction is unsafe and prohibited. Entering - Only enter the track at the start point. For the safety of all riders, do not enter at any other point. Keep moving - For your safety, do not stop anywhere on the track. Pull off the track if you are not moving. Berms and turns - Do not ride on, sit on or slide down berms or turns. Familiarize yourselves - Riders must make themselves familiar with the track and the hazards before riding. The BMX track (originally owned and operated by the City Recreation Department) opened in 1978. The city recreation department merged with the Springfield Park District in 2003. 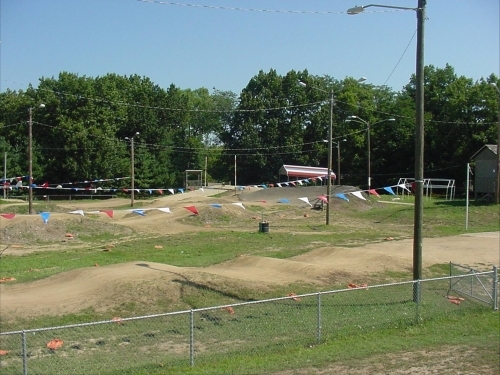 The merger included the annexation of several properties including the BMX track. Today, the Springfield Park District has partnered with the Springfield BMX Club to provide an all inclusive BMX program that provides recreational programs for both kids and adults. The BMX Club strive to provide a high quality NBL (National Bicycle League) program, in fact, riders from the Springfield BMX Club have been racing and dominating in the Illinois State Championship Series for years. The Springfield Park District has partnered with the Springfield BMX Club to provide an all inclusive BMX program that provides recreational programs for both kids and adults. Outside of scheduled practices and meets, the BMX course is open to the general public at no cost, from sunrise to sunset. Riders under 18 years old must have parent or guardian present at all times. Must wear long pants, long sleeve shirt and either approved full face helmet or helmet with mouth guard at all times when on the track. No riding when the track is wet. No stopping on the track. No profanity or vulgar language by riders or parents. No violence or threats of violence. No vandalism, defacing, damaging or destroying public or private property. Please clean up area around you and place trash in receptacles.